Wanna know why I like heading to the Mall of America at lunch time? It’s all about this Savory Squash Soup at Wolfgang Puck Express. Lusciously creamy and packed with tons of subtle flavors that meld so wonderfully together, this is my little bowl of happy comfort. At the restaurant, they serve this soup with a red pepper coulis drizzled over the top. And it’s really, really good. I convinced Hatti to try my soup the last time we visited, and I didn’t get much of the rest of that coulis. She loved it. 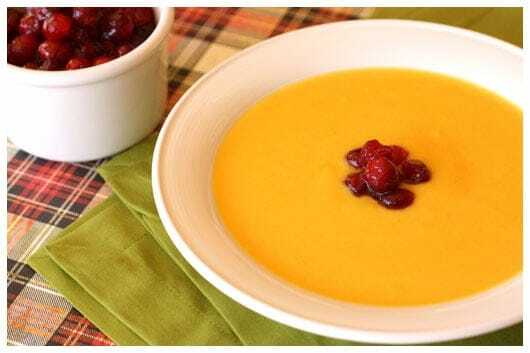 I couldn’t find the official recipe for that lovely sauce (I’ll be working on perfecting it on my own), but on the Wolfgang Puck website, they feature the squash soup with this cranberry relish. I like cranberry. So I gave it a shot. And I’m so glad I did! Visually, that beautiful ruby relish was very striking atop the golden soup. And for the tastebuds? Wow! The cranberries cut right through the richness with their tart bright bite. 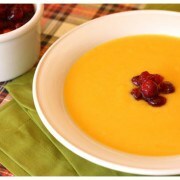 For as much as I kept adding cranberry relish to my bowl of soup, I’m considering renaming it Cranberry Squash Soup. Yep, it was that yummy. Now, if given the choice, I honestly don’t know which one I would choose. Red pepper coulis or cranberry relish? They are both scrumptious in their own special way. Such a delicious dilemma to have. In a medium stockpot, melt 4 tablespoons of butter. Over low heat, sweat the onion. Do not let it brown. 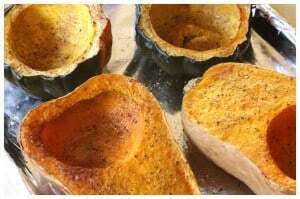 Add the pureed squash and cook over very low heat until heated through, stirring occasionally. Do not allow it to bubble up. Season with the ginger, cardamom, cinnamon, brown sugar, and lemon juice. Pour in the stock and bring to a boil, still over low heat, stirring often. Cook 20 minutes. 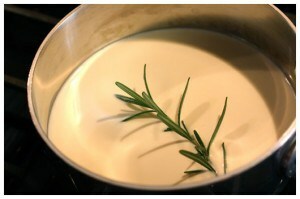 In a small saucepan, heat the cream with the rosemary sprig. Remove the rosemary and pour the cream into the soup. Transfer to a blender or food processor and process, in batches, for 2 or 3 minutes. I used an immersion blender. Be careful – it’s HOT! Add salt and pepper to taste. To serve, ladle soup into bowls. Place a heaping tablespoon of Cranberry Relish in the center. In a small saucepan, combine all the ingredients. Bring to a boil, then lower to a simmer. Continue to cook until the mixture is thick and the berries are glazed. Allow to cool. Transfer to a covered container and refrigerate until needed. Serve with Savory Squash Soup.